Because there aren't many FT thru-hikers each year, businesses along the trail have yet to adapt to their needs and as a result, resupplying fuel can be frustrating, but only if you are limited to white gas (aka Coleman fuel) or canister fuels. Along the Appalachian Trail hikers can buy white gas and denatured alcohol by the ounce, but not on the FT. Similarly, stores near the FT may stock large butane canisters for RVs and car-camping grills, but not 4oz isobutane fuel canisters for Jetboil, Snow Peak GigaPower, MSR Reactor, or MSR Pocket Rocket stoves. If you use an alcohol stove, you should have no problem resupplying fuel regularly. While trailside businesses do not sell denatured alcohol or white gas by the ounce, we have found convenience stores consistently carry isopropyl rubbing alcohol in concentrations strong enough to ignite (70-90% rather than the watered-down 10-20%). On the PCT, some alcohol stove users have been using a gas-line antifreeze called HEET. Found in gas stations, it burns because it contains methanol, but HEET also contains Xylene and secret proprietary compounds. For environmental and health reasons we strongly discourage the use of HEET. First, you will inevitably spill fuel and you should not be pouring antifreeze into the environment. Additionally, fumes from alcohol stoves enter your food, and who knows what horrible compounds are released from the burning of anti-freeze (a check of its material safety datasheet provided no answers). Our town guide does not include locations where you can find HEET. For those who use a Jetboil, MSR Pocket Rocket, Snow Peak GigaPower, or some other canister stove, resupplying fuel is difficult on the Florida Trail. Stores in trail towns do not carry canisters. 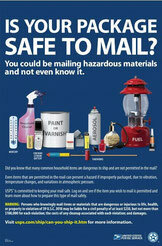 The best option for resupplying canisters is to ship it them maildrops. Mailing fuel cans means having a potentially frustrating experience at the post office. Walk into any post office and you are likely to see the poster on the right. According to it, fuel canisters are prohibited in the mail—it’s clear as day right there in the picture. However, according to USPS regulations posted on the USPS website, you can ship backpacking fuel canisters and non-pressurized liquid fuel if the package is marked “ORM-D” and/or “Surface Delivery Only." “ORM” stands for Other Regulated Materials. The following two USPS documents are relevant to backpackers trying to ship fuel to themselves. Both documents contain the same information. It is a good idea to print out Publication 52 Section 342.22a-c (or keep the PDF on your phone) and bring it with you to the post office in order to trounce stubborn post masters who are unfamiliar with ORM-D guidelines and tell you “no” without double checking the regulations first. Expect at least some clerks at post offices to be unfamiliar with them. In my experience it has been about 50/50. Gases are prohibited in international mail. Toxic gases in Division 2.3 are prohibited in domestic mail. Flammable gases in Division 2.1 are prohibited in domestic mail via air transportation but are permitted via surface transportation if the material can qualify as an ORM-D material (or effective. January 1, 2021, as a consumer commodity material) and meet the standards in 10.12.3 and 10.12.4. Mailable nonflammable gases in Division 2.2 are generally permitted in the domestic mail via air or surface transportation if the material can qualify as an ORM-D material when intended for surface transportation, or as a consumer commodity material when intended for air transportation, and also meet the standards in 10.12.3 and 10.12.4.